Flash memory is forecast to represent the largest share of capital spending while DRAM capex grows at the highest rate this year. August 28, 2018 -- IC Insights forecasts total semiconductor capital expenditures will rise to $102.0 billion this year, marking the first time that the industry has spent more than $100 billion on capital expenditures in one year. The $102.0 billion spending level represents a 9% increase over $93.3 billion spent in 2017, which was a 38% surge over 2016. Figure 1 shows that more than half of industry capital spending is forecast for memory production—primarily DRAM and flash memory—including upgrades to existing wafer fab lines and brand new manufacturing facilities. Collectively, memory is forecast to account for 53% of semiconductor capital expenditures this year. 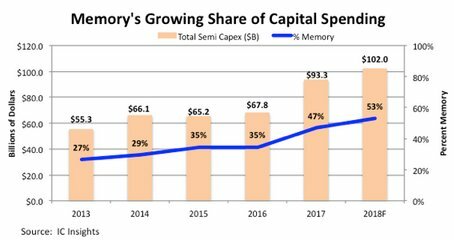 The share of capital spending for memory devices has increase substantially in six years, nearly doubling from 27% ($14.7 billion) in 2013 to a forecast of 53% ($54.0 billion) of total industry capex in 2018, which amounts to a 2013-2018 CAGR of 30%. Of the major product categories shown, DRAM/SRAM is forecast to show the largest increase in spending, but flash memory is expected to account for the largest share of capex spending this year (Figure 2). Capital spending for the DRAM/SRAM segment is forecast to show a 41% surge in 2018 after a strong 82% increase in 2017. Capital spending for flash memory is forecast to rise 13% in 2018 after a 91% increase in 2017. After two years of big increases in capital expenditures, a major question looming is whether high levels of spending will lead to overcapacity and a softening of prices. Historical precedent in the memory market shows that too much spending usually leads to overcapacity and subsequent pricing weakness. With Samsung, SK Hynix, Micron, Intel, Toshiba/Western Digital/SanDisk, and XMC/Yangtze River Storage Technology all planning to significantly ramp up 3D NAND flash capacity over the next couple of years (and new Chinese memory startup companies entering the market), IC Insights believes that the future risk for overshooting 3D NAND flash market demand is high and growing. Details on capital spending and other trends within the IC industry are provided in The McClean Report—A Complete Analysis and Forecast of the Integrated Circuit Industry (released in January 2018). A subscription to The McClean Report includes free monthly updates from March through November (including the Mid-Year Update), and free access to subscriber-only webinars throughout the year. An individual-user license to the 2018 edition of The McClean Report is priced at $4,290 and includes an Internet access password. A multi-user worldwide corporate license is available for $7,290.